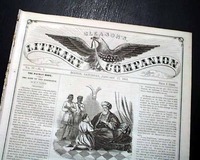 GLEASON'S LITERARY COMPANION, Boston, 1863 Obviously a literary publication from the Civil War era, the prime feature being the huge eagle engraving in the masthead, with a wingspan of 7 inches. 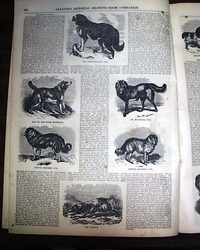 There are a few illustrations within, mostly being text. 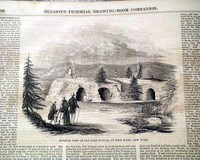 Sixteen pages, 11 by 15 inches, great condition. 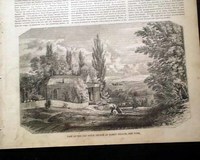 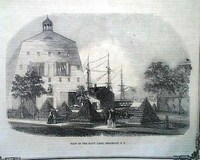 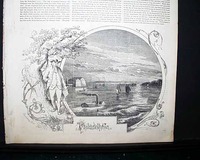 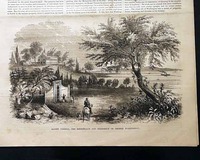 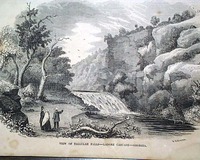 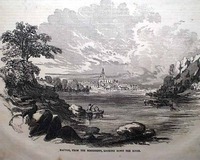 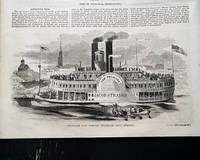 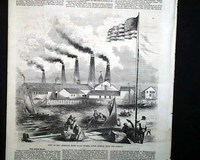 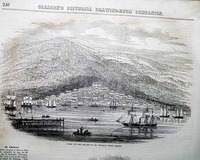 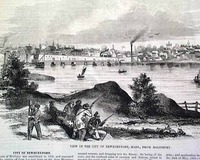 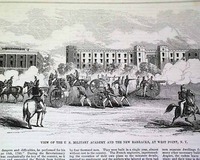 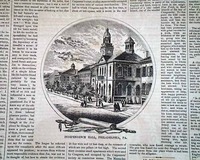 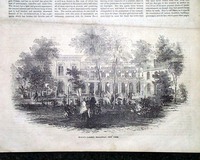 One the front page of this issue there is a large illustration of a "View In The Navy Yard, Brooklyn, N.Y." with a related article titled "Navy Yard, Brooklyn". 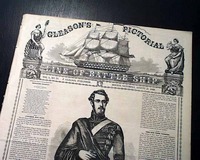 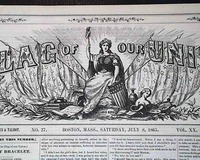 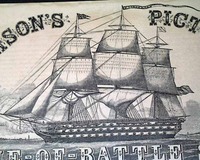 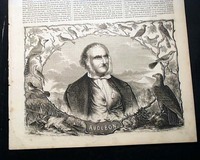 GLEASON'S LITERARY COMPANION, Boston, June 20, 1863 The masthead features a very large heraldic eagle with a 7 inch wingspan holding in its beak a banner with the title. 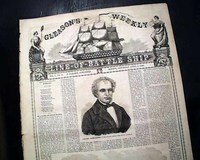 Mostly filled with literary items including a ftpg. 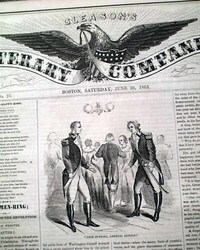 story: "The Omen-Ring, or The Traitor of the Revolution" which has a print showing Benedict Arnold. 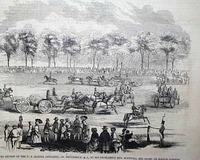 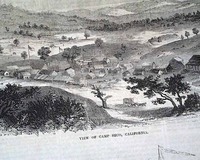 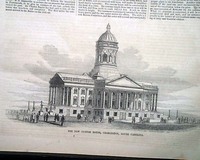 Another page has some tidbits relating to the Civil War. 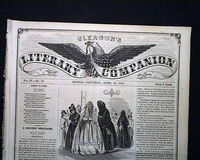 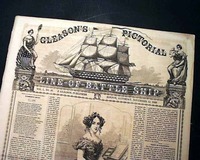 GLEASON'S LITERARY COMPANION, Boston, April 18, 1863 The masthead features a very large heraldic eagle with a 7 inch wingspan holding in its beak a banner with the title. 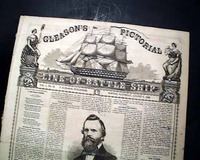 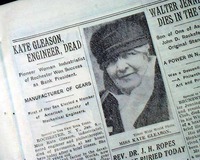 Although mostly filled with literary items there are some columns with news of the day, including Civil War-related items. 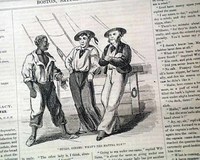 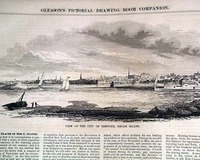 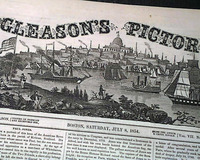 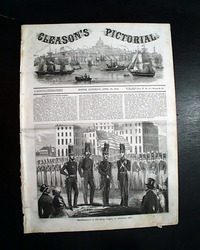 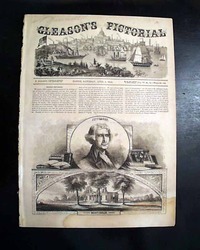 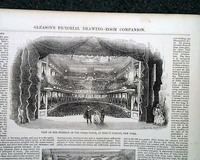 GLEASON'S PICTORIAL, Boston, April 10, 1852 This title was formatted much like the more popular "Harper's Weekly" being tabloid-size with several pages of prints. 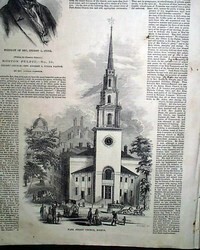 This title actually precedes Harper's, which did not begin publication until 1857. 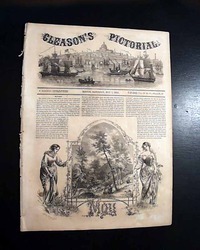 This newspaper has one of the largest & most decorative mastheads of the 19th century (see photos) with a decorative border around all pages. 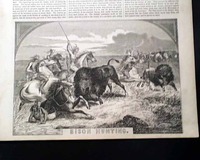 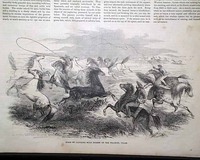 On the front page there is an illustration titled "Mode Of Catching Wild Horses On The Prairies, Texas" and a related article: "Catching Wild Horses On A Prairie". 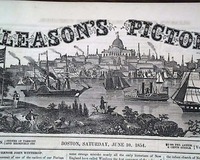 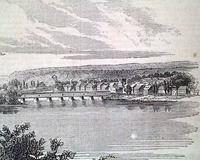 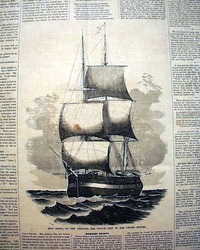 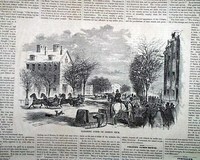 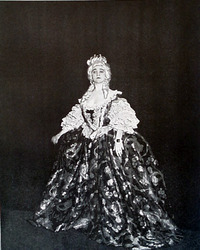 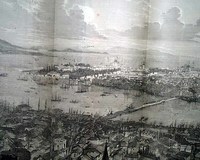 GLEASON'S PICTORIAL, Boston, April 29, 1854. 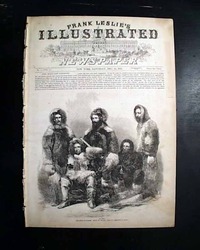 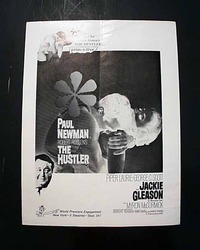 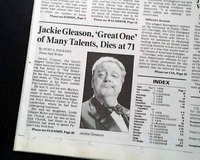 This title was formatted much like the more popular "Harper's Weekly" being tabloid-size with several pages of prints. 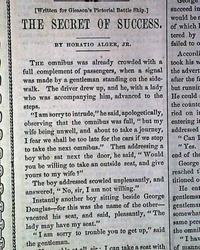 This title actually precedes Harper's, which did not begin publication until 1857.